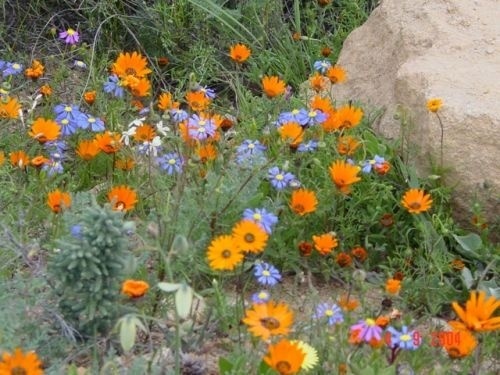 Situated in Namaqualand we see the tapestry of spring flowers come alive during the months of August to September. This is the only arid biodiversity area in the world, offering the visitor its natural flower show each year, along with the Groen and Spoeg rivers. 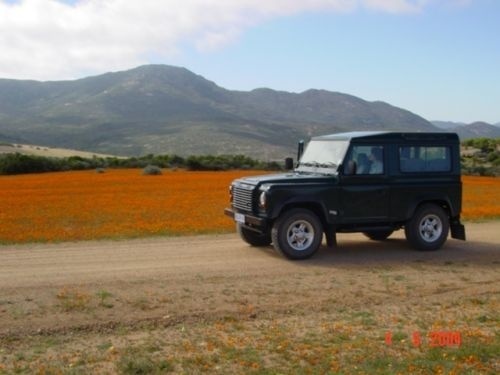 The Rooikat 4WD route starts at Skilpad and covers a distance of 176-200km. It can be done in a day, but it's a much more comfortable drive when done over 2 days. There are 4 self-catering units available for overnight stay. There's also camping available near the coast, but the facilities are limited. The Rooikat Route is a R100 per car, and a R24 Park Fee. They are motorbike friendly. (Aug-2018). Caracal. Steenbok. Klipspringer. Black-Backed Jackal. Leopard and Grey Duiker. Vehicle fuel and ATM facilities are not available in the park itself but at the nearby town Springbok 87km away. Vehicle repairs, post office and police services are available at Kamieskroon. Medical services only in Springbok. No shop, restaurant or fuel is available in Namaqua National Park. Travellers must take along their own firewood.